In the United States, it is estimated that more than 1.1 million people are infected with HIV/AIDS (Centers for Disease Control and Prevention [CDC] 2013). Data indicate that individuals with HIV infection suffer far greater housing instability and homelessness than the general population: an estimated one-third to one-half are homeless or at risk of becoming homeless (Rourke et al. 2010). People living with HIV/AIDS (PLWHA) who lack stable housing are more likely to delay entering HIV care and less likely to have access to regular care, to receive anti-retroviral therapy (ART), or to adhere to their HIV medication regimen (White House Office of National AIDS Policy 2010). The two main sources of federal housing assistance targeted specifically to PLWHA are the Housing Opportunities for Persons With AIDS program (HOPWA), provided through the U.S. Department of Housing and Urban Development (HUD); and the Ryan White HIV/AIDS Program (RWP), provided through the Health Resources and Services Administration (HRSA) of the U.S. Department of Health and Human Services (HHS). HOPWA’s primary focus is on providing housing assistance and related support services to PLWHA and their families. RWP’s is to provide HIV treatment and care: grantees can spend only a portion of funds on support services (of which housing assistance is one type). In 2010, the Obama administration created the country’s first National HIV/AIDS Strategy (NHAS), designed to reduce the number of new HIV infections, increase access to HIV care, optimize health outcomes for PLWHA, and reduce related disparities (White House Office of National AIDS Policy 2010). Recognizing the role of housing in the HIV epidemic, the NHAS identified ways to increase federal HIV housing supports. To address the NHAS goal of greater access to HIV care, in 2011, the HUD Office of HIV/AIDS Housing awarded seven competitive Integrated HIV/AIDS Housing Plan (IHHP) grants that were designed to integrate housing assistance with HIV care and other supports at the individual service and community planning levels. 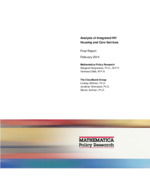 In 2012, the HHS Office of the Assistant Secretary for Planning and Evaluation (ASPE) contracted with the Mathematica Policy Research/Cloudburst team to analyze current federal HIV housing assistance services and study best practices integrating HIV housing and health care services. This project includes a quantitative study of the costs, utilization, and outcomes of current federal HIV housing assistance services and a qualitative study of innovative IHHP programs integrating housing assistance with HIV care. The quantitative analysis includes significant findings: (1) a direct comparison of 2010 HOPWA and RWP data; (2) a housing assistance analysis of 2010 RWP Services Report (RSR) data, (3) a feasibility assessment of a correlational study of HOPWA and RWP housing assistance and outcomes, and (4) national, state-level, and time trend analyses. The qualitative analysis documents key features of four IHHP sites, including their site characteristics, program models, and integration of HIV housing, health care, and other supports. These IHHP grants are unique in their efforts to integrate housing and HIV care at three levels: individual client services, organizational data systems, and community-level planning processes. The reported number of PLWHA in the United States in 2010 was 888,904.1 Almost 1 in 10 (81,100) were receiving HOPWA and/or RWP housing assistance. Because HOPWA and RWP serve different purposes, the proportion of funding targeted toward housing assistance was very different. Whereas two-thirds (67%) of HOPWA’s funding was used for housing assistance in 2010, a total of 3.2 percent of RWP funding was used for housing assistance. In general, the characteristics of participants served were similar across the two programs. HOPWA participants (which include family members) tended to be younger because HOPWA serves more families with children than RWP. In both programs, the majority of participants served were within the lowest poverty category (at or below 100% federal poverty level [FPL] for RWP and up to 30 percent of Area Median Income for HOPWA). Because HOPWA and RWP collect housing status data at different points of enrollment, it is not possible to compare housing status across the two programs prior to program entry. However, HOPWA reported that 13 percent of participants were homeless at entry. Although RWP housing status is measured “at the end of the reporting period” and not at program entry or exit, among RWP Clients receiving housing assistance, about one quarter (24%) were “temporarily or unstably housed,” compared to 14 percent that were not receiving RWP-funded housing assistance. Of the RWP clients receiving housing assistance, 5 percent were still “unstably housed” at the end of the reporting period. This emphasizes the importance of connecting RWP clients to long-term or permanent housing assistance through HOPWA, homeless Continuum of Care (CoC), or other mainstream public housing programs. 1 The reported number of PLWHA differs from the 1.1 million estimate of the total number of people in the U.S. with HIV/AIDS due to the status of names-based HIV surveillance systems in 2010. The project studied four IHHP sites representing a range of service models and approaches: (1) the River Region Human Services (RRHS) FUSE project in Jacksonville, Florida; (2) the Frannie Peabody Center (FPC) statewide Maine IHHP project; (3) the Portland (Oregon) Housing Bureau (PHB) S4H project; and (4) the Albany Corporation for AIDS Research, Education, and Services (CARES) Foundations for Living (FFL) project in upstate New York. The four IHHP sites in this study have extensive experience providing HIV housing assistance and support services in collaboration with local partners. They have also been involved in community-level planning of homeless services through their participation and leadership of CoC planning processes and in RWP planning councils, task forces, and provider networks. The IHHP program models show a gradient of service integration (from most to least): (1) all four sites provide direct housing assistance; (2) all four sites fund “housing coordinator” positions; two sites contract them out; (3) two sites fund “employment coordinator” positions; both sites contract them out; and (4) no sites fund medical case management directly; all four sites collaborate with medical case managers funded by RWP. Program components that facilitate service integration include (1) in-depth screening of clients’ housing, health care, and other support service needs at intake; (2) development of individualized care plans for program clients tailored to their needs and circumstances; and (3) frequent in-person contact between housing coordinators, peer specialists, and clients and their medical providers and medical case managers. Two IHHP sites are also participating in a HRSA Special Project of National Significance addressing the coordination of housing and HIV care. In those medical home-focused programs, the sites are working with clients who are more medically needy and less likely than IHHP clients to become employed and mainstreamed into public housing. Recent funding restrictions at the federal, state, and local levels are limiting the grantees’ ability to fully realize their IHHP goals. Additional concerns include (1) the lack of affordable housing available; (2) uncertainty about the potential impact of the Affordable Care Act on RWP-funded services, notably medical case management; and (3) the need for HIV service providers to shift from simply securing HIV-specific benefits for their clients to helping clients move into mainstream housing and employment. Neither HUD’s Homeless Management Information System (HMIS) nor HRSA’s CAREWare data system has the comprehensive set of housing and health care data needed to evaluate the effectiveness of the IHHP grantees’ programs. All four sites are working on data system integration to address this problem. The IHHP grantees plan to bring together groups from public housing, homeless (CoC) grantees and service providers, city planning, RWP grantees, and AIDS service organizations to create community-wide IHHP plans, but note two challenges: (1) CoC and RWP grantees do not typically have a history of working together, and (2) some worried that HOPWA programs were historically marginalized in both CoC and RWP planning processes. This section offers ideas for how the service integration and data management of integrated housing and HIV care programs can be improved through further study and policy development. The IHHP sites should be revisited at the end of their grant cycle to see how they were able to develop an integrated planning process at the community level and what they have accomplished in terms of creating more integrated data systems. The potential impact of the Affordable Care Act on the linkage between HOPWA housing assistance and RWP case management programs could be significant. Monitoring and researching as Affordable Care Act coverage expansions are implemented in 2014 and beyond is warranted. The three-way model of housing assistance, employment services, and HIV care integration should be studied in more detail, and the model’s effectiveness evaluated as an alternate model of service integration. New demonstration projects pooling HOPWA and RWP resources into one integrated HIV housing and care program should be considered and researched as an alternate model bundling housing with health care. Adding client-level variables that are common to both HOPWA and RWP data systems, including variables that capture the assistance received from both programs, would allow better linkage of the programs’ databases and facilitate research examining the services received and resulting outcomes for participants served by both programs. Increased understanding of the differences between PLWHA who receive housing assistance and those who do not could help to inform and improve housing practices addressing the unique needs of these subgroups. It may also be valuable to explore state-level program differences in greater detail. The creation of new integrated CoC intake systems might involve developing new linkages among HMIS, CAREWare, and electronic health record data systems. This development should be monitored and studied to see what new data system forms result.